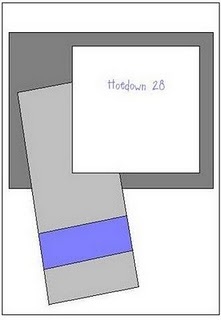 For this weeks Hambo Hoedown the challenge was to use a sketch to make your card. We were also given the hedgehog digital image. I am not the best at using sketches so I hope you like my take on it. I added dimension by popping up the little sentiment. I love using Hambo images there is just something fun and happy about them. You should check them out! This card is in honor of Monica's birthday yesterday! Happy Birthday Monica! Her and Her husband own Hambo Stamps. Here is a link to this challenge. What a cheerful card. I like the green circle DSP with the bright flower DSP. Good job on the coloring too, Thanks for playing this week. Love your take on the sketch and such a cute image. I really like the papers, matting and punches you used. You did a super job with the Hoedown sketch! Love your cheery card~! Oh, this is so cute! 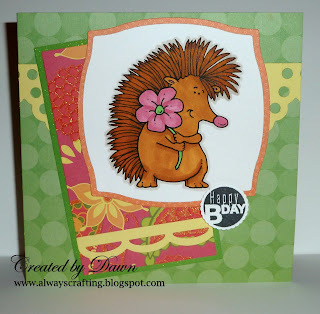 I love the bright cheery colors and Hedgies little pink nose~adorable! Thanks for playing along in the hoedown!